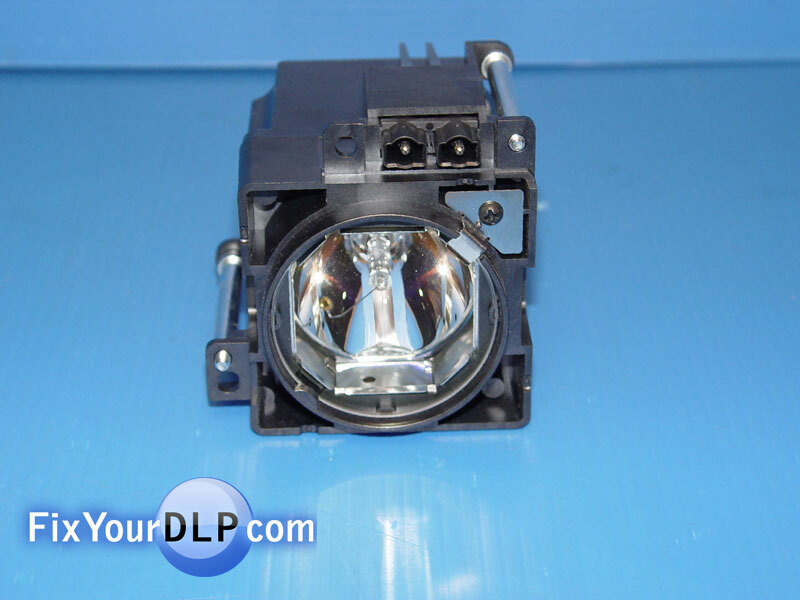 OEM DLP lamps, Plasma & LCD parts. Same day shipping, lowest prices on the internet. 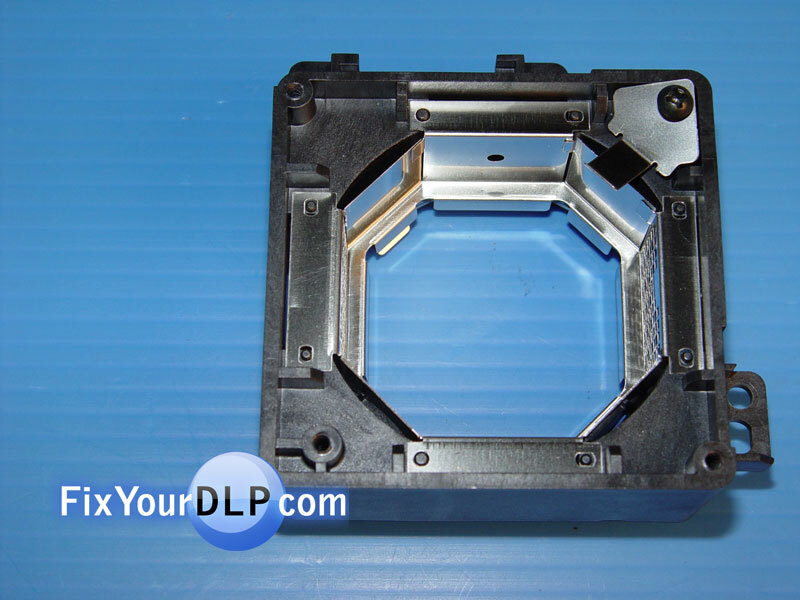 For Part Number: PKCL120UAA, PK-CL120UA, PKCL120UA, PK-CL120U, PKCL120U, PK-CL120, PKCL120, PK-CL120UAANP, PKCL120UAANP, PK-CL120UAAN, PKCL120UAAN, PK-CL120E, PKCL120E, PK-CL120J, PKCL120J, PK-CL120C, PKCL120C. 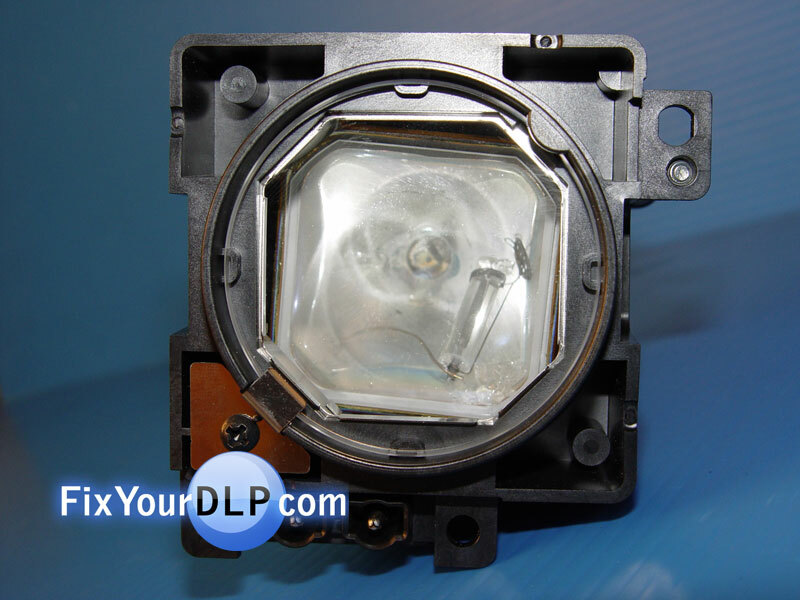 (Unsealed replacement lamp for DLP televisions, small lamp). Compatible TV Models: HD-58S998, HD-65S998. 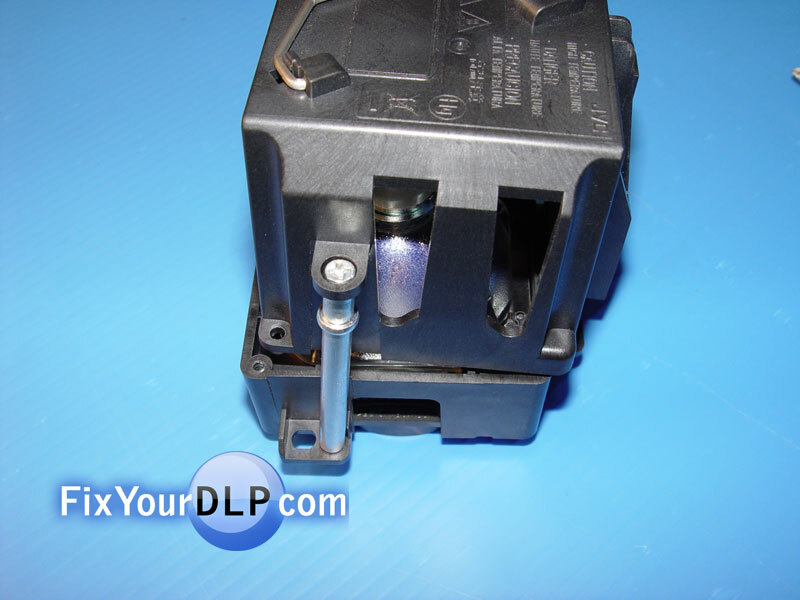 Assembly part numbers: LC21571, LC21570, QLL0160-003. 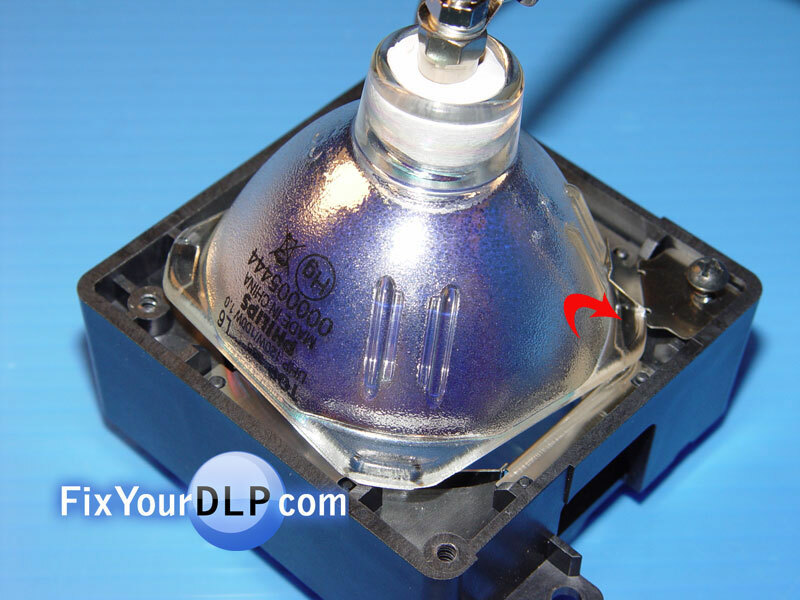 — Do NOT purchase generic brand lamps such as LTI, APO or third-party manufacturers such as OSRAM. 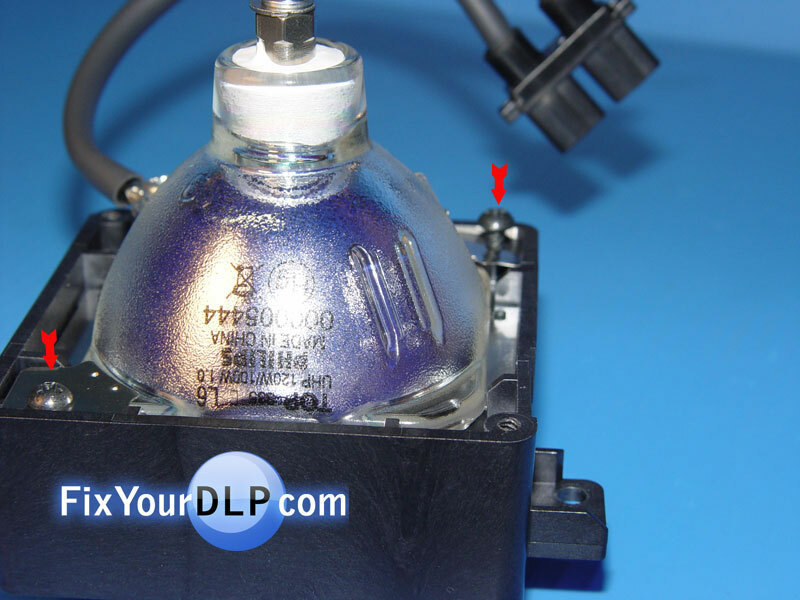 These lamps were NOT engineered with and for your JVC TV…only the original lamp has been engineered to work flawlessly and output the best possible color. Above that, it just doesn’t make sense to choose an aftermarket lamp for a $5-$10 difference (and in many cases they are more expensive!!). Be a smart consumer and do your research! 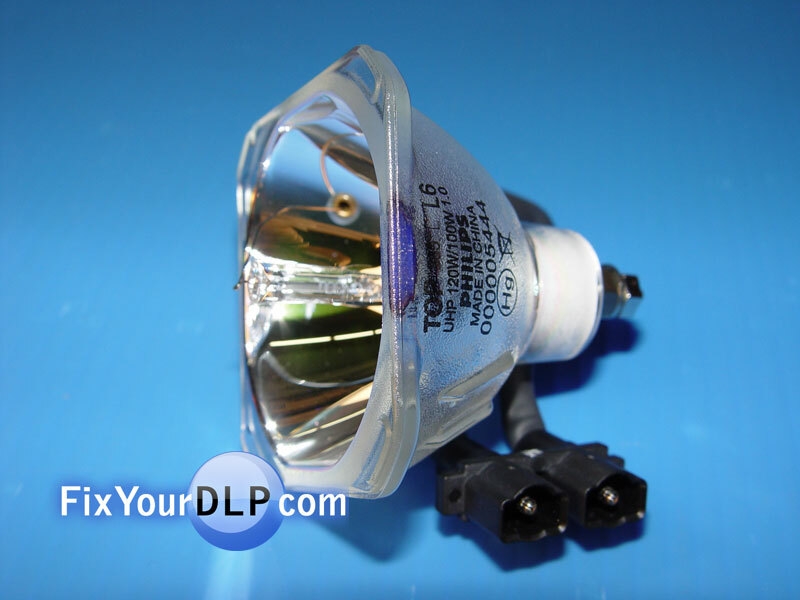 Discount-Merchant.com promises to be the low price leader in all Projection TV Lamps they carry…if this is not true, let us know and we’ll fix it! Tools Required: Standard Philips or screwdriver Tork # 10, Pair of Pliers, A new lamp. Time Required: About 15 minutes. 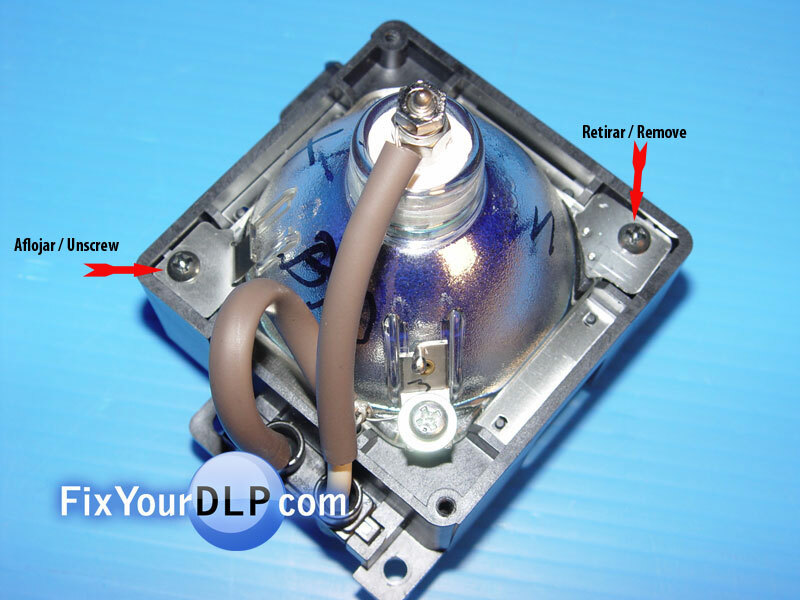 Abstract: This guide is being published to show how easy it is to replace your original JVC Lamp PK-CL120UAA. 1.- Remove the four screws (one on each corner) to start removing the lamp housing. 2.-Now lean over the lamp just a little and pull gently to open and remove the housing. 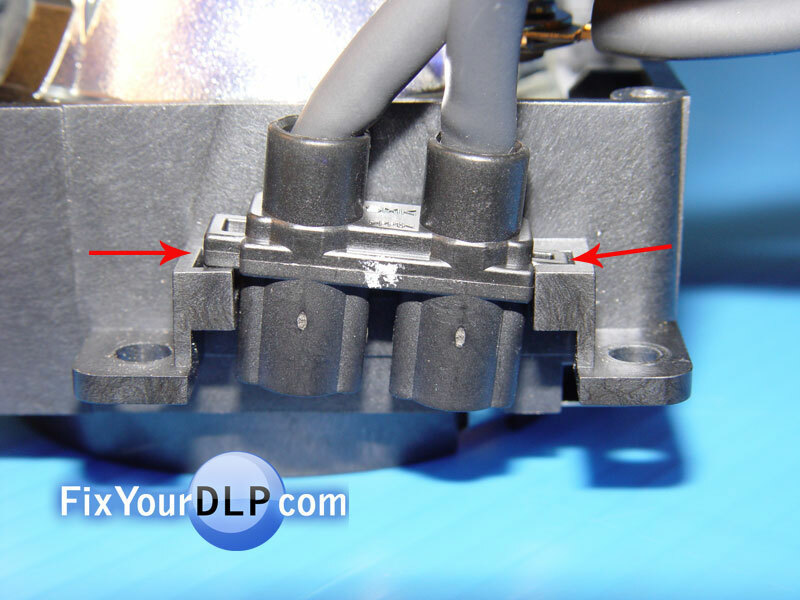 3.-Inside the exposed lamp you’ll notice two clips securing the lamp held by a screw. 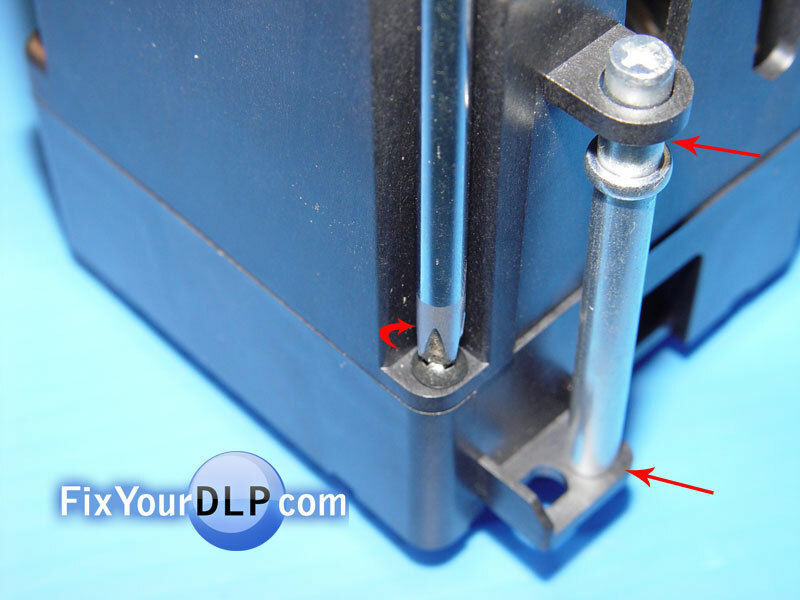 4.- Let's remove one of the clips and the screws to set the bulb free from the enclosure. 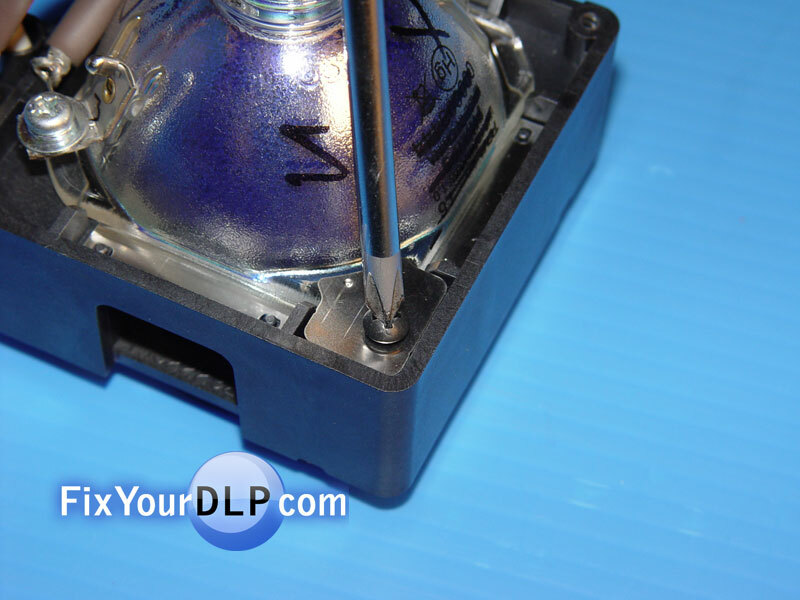 5.- Carefully lean it over just a bit and pull it out, the bulb will come off with the plastic cables still attached. 6.- This is the base of the lamp; in which the new one will be placed. A : Insert the new lamp by leaning it over just enough to avoid the security clip. B : Place back the second clip you removed earlier by tightening the screw until it doesn’t move. C : Make sure that the cable connector is placed correctly. 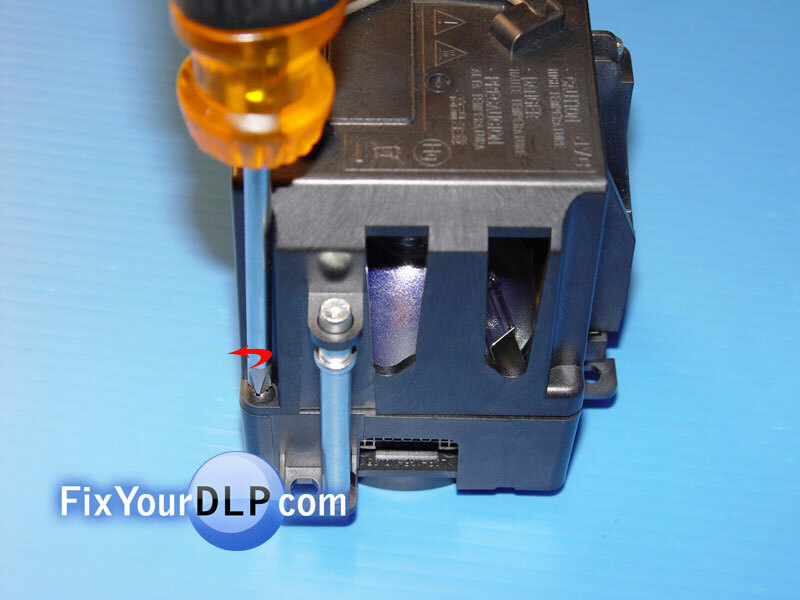 D : To place the top correctly you must lean to the side the two long metal screws so they enter in their respective places. E: Once that’s done insert back the other screws on each corner. IMPORTANT: After installing the replacement bulb, you should wipe it with a clean cloth to avoid any dirt or oil. Our hands are naturally oily…this could reduce considerably the life span of the new lamp. 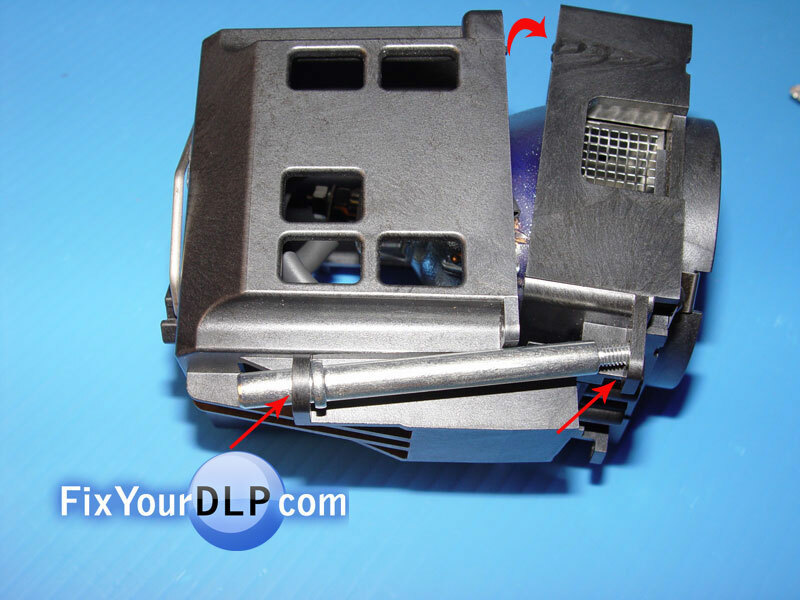 Again, Discount-Merchant.com promises to be the low price leader in all Projection TV Lamps they carry…if this is not true, let us know and we’ll fix it!